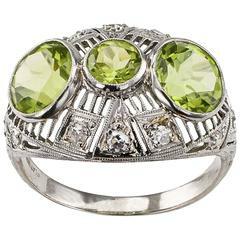 Fine bright green natural Peridot, probably Egyptian, handmade in platinum, the fine bright green stone weighs 44 cts. 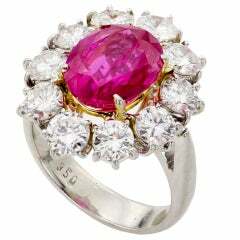 It is surrounded by fine white diamonds (F/G) and very very slightly included and then further surrounded with bright red fine rubies. The entire ring is micro set with diamonds. Notice the attention to detail on the verso. This ring while not signed has all the hallmarks of a fine jewelry house. This ring is now a size 6.5 and we can size it.